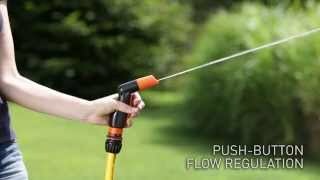 Versatile state-of-the-art design spray pistol, it can be used to water plants and also for outdoor cleaning work. Equipped with two different jets, concentrated or fan spray, which can easily be selected by simply rotating the front cap. The handy push-button system allows you to adjust and shut off the flow of water with a simple movement, without tiring your hand and directing the jet with the utmost precision.